3.5 kg. , 7.7 lbs. This weekend was going to be our last weekend at Beaver Lake, Arkansas since it is starting to get cold out here in the Midwest. We frequent this lake often in the pursuit of Striper... but I have NEVER been given the opportunity to shoot one. 2017 has been, by far, the year I have hunted the hardest and I was hungry for a Striper. We arrived at the lake Saturday on the last day of September and we had a hard time finding the fish. We just kept seeing small ones. Being that the limit is 1 and that this lake is known to produce BIG Striper, we hunted on. I was able to line up on two separate fish and missed both times. SO frustrating. Sunday was the 1st day of October and the hunting went a little more of the same. Tough going. I renewed my faith in my shooting abilities with limiting out on Walleye. So, I started to feel good again. It was nearing the end of the day, and Dusty was able to graph a large school, so I hopped in. I had been riding on the back of the boat all day between dives just breathing up and being ready to hop in at a moments notice. Less than 10 seconds after hopping in, I was headed down. There they were! I waited for the school to come around to see if there was a monster towards the back and didn't see anything huge, so I shot the biggest one I could see. The feeling was amazing! 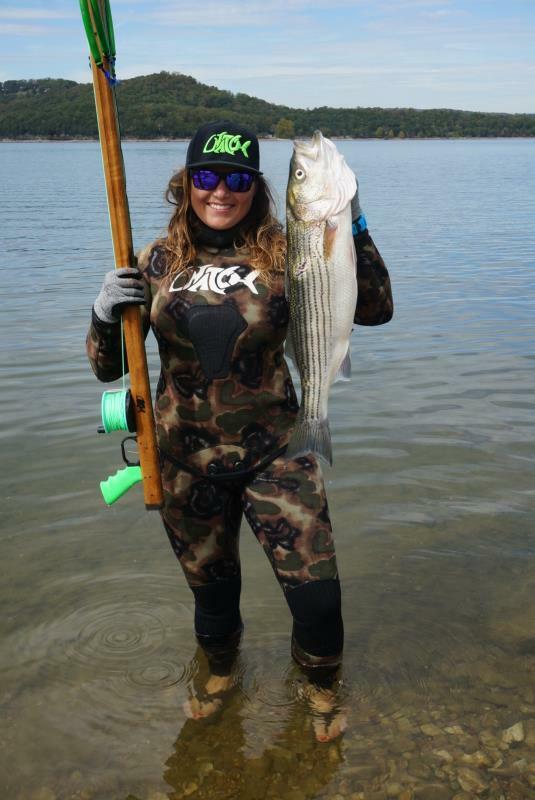 My first Striper and setting the 1st Womens Speargun Striper record!